t: video profile of tea artisan Pei Wang produced by Vidya Lahoti. Brewing tea is pressing a pause button in a stressful life, taking a few minutes to be in the present, attend to the tea leaves ‘dancing’ in their tea pot and enjoy the calm, focused, meditative state that we need for social, emotional, physical, spiritual and mental wellbeing. Pei takes the tea ritual out into unlikely, busy, spaces: an unusual tea event in Trafalgar Square promoting mindfulness. Teanamu chaya teahouse is in Notting Hill, London. Pei Wang grew up in Singapore, the grandson of immigrants from Hainan island in China. He is a Buddhist, with a heritage of Taoism and Confucianism. Food played a central role in his family, and at his mother's knee Pei learned to honour and respect the Five Qualities of aesthetics, taste, quality, savouriness and texture. In Chinese tradition it is through the medium of food that mothers express their love, philosophers reflect on moral wellbeing and healers cure the sick. This ingrained relationship with food, this deep love of food preparation and consumption, informed Pei's later exploration of other aspects of his complex civilization - its language, myths, literature, ideas and, not least, its culture of tea. Pei steeped himself in the study of tea in China, Singapore, Malaysia, Japan. He is a certified Tea Artisan and Tea Assessor, having trained with Prof. Tsai Rong Tsang (Dean of Tea Culture at TenFu Tea Institute in Fujian Province, China), Dr. Zhou Wen Tang (China National Tea Museum in Hangzhou) and tea master Hooi Yoke Lian (author and tea master in Malaysia). Captivated by the profusion of wonderful flavours and styles of Chinese tea, he explored the rituals and history of tea culture, developing a profound understanding of the underlying thinking, as it relates to social order and man's relationship to his senses. Tea drinking, for him, is both an art form and an evocation of a harmonious connection between people. It has a personal and a social aspect. It is a sensual, an intellectual and a contemplative experience. For Pei, it is a lifelong path. Pei graduated with an honours accountancy degree from the Nanyang Technological University in Singapore in 1996 and worked in accountancy and IT. He later trained at the renowned classical French culinary institute Le Cordon Bleu in London and is keen to use tea as an ingredient to enrich traditional French pâtisserie and to promote the innovative art of modern and classical tea cuisine. London-based tea aficionado, Pei Siong Wang, holds tea appreciation classes at his house in Notting Hill, London. 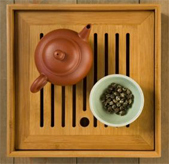 While looking up Chinese tea online, I chanced upon the website Teanamu.com with its treasure trove of facts and anecdotes on Chinese tea. Singaporean Pei Siong Wang, the man behind Teanamu, sells quality Chinese and Japanese tea online, runs tea appreciation classes and does tea cookery lessons out of his home in the charming and affluent Notting Hill neighbourhood of London. What struck me most about Pei was how his ardour for tea seemed to leap out of his well-articulated and thoughtful blogs on the subject. I spent time reading rave reviews by other foodies about his tea classes. Finally, a bilingual tea aficionado serving as a bridge between the Chinese tea market and the English-speaking world! Trained as an accountant, Pei's love affair with tea started about 12 years ago during a quest to unearth his Chinese roots. On one of his visits home, Pei signed up for a tea masterclass workshop at Purple Cane in Kuala Lumpur. Afterwards he went back to the UK and started drinking tea in a ritualistic way. "I found a few simple leaves could create such a wonderful aroma and a wide range of flavours," says Pei, during our meeting at Purple Cane Tea Restaurant. Pei was on a day trip to Kuala Lumpur while on a Chinese New Year break in Singapore. "I realised that the tea ceremony is not just about making tea. There's a long cultural history behind it, and every single component of the history fascinates me." Buoyed by his first masterclass experience, Pei plucked up the courage to do a tea artisan and tea assessor exam in China and trained under different tea masters in China and Malaysia. He also tried different teas and pored over books and articles. Back in the UK, Pei was invited by the British Museum to do a monthly workshop on Chinese tea appreciation during its six-month Chinese Terracotta Army exhibition in 2008. "It was nerve-racking because I see myself as a beginner, and I still do, because there's so much to learn," admits Pei who was then a computer programmer. The museum stint gave him the impetus to take the plunge into the tea business. A self-professed food lover and cooking buff, Pei also enrolled in the prestigious Le Cordon Bleu Patisserie School in London. "A naughty thing that I'm doing is taking classic English or French recipes and adding tea to it," he adds. Some of his creative fares include green tea macaroons with yuzu (Japanese citrus fruit) filling, white tea and rose madeleines, salmon with Lapsang Souchong rub and green tea jelly with oolong sorbet and red bean paste. 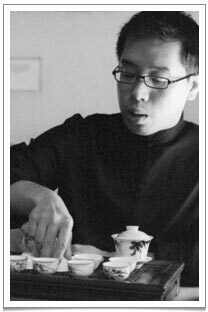 In his tea classes, Pei explores the rituals and history of tea culture. "And if you can extend that to your everyday life - being kind and compassionate to everyone and everything around you, it makes for a better life." Pei likens the tea ceremony to a "pause button" we can press. "You enter the tearoom, enjoy the tea and revel in the moment. You don't think about the e-mails you need to answer or deadlines, and take a respite from our hurly-burly lives," he adds. "A tea poet friend of mine uses a phrase that sums it up best: "Giving a cup of tea is like giving a cup of now." a "pause button" we can press. Though Pei's classes are designed to last two hours, the sessions are usually longer, with some stretching to seven hours. "When people first come in, they're scared of tea but when they try the different teas and learn more about tea culture, they tend to get calm and sink into a meditative state. It's hard for me to say: This class is finished, please leave because I need to rest," he chuckles. "It's nice to introduce the joy of tea to people. I managed to convert some coffee lovers who hated tea!" Generally, the Western way of appreciating tea is still about quality and taste, Pei adds. "Tea drinking is very personal - I might tell you that this tea was made in 1920, it's really good and you should be able to taste notes of leather, wood and mango," explains Pei. "But if you can't taste it and you don't like it, no matter how expensive it is, it's useless to you." Like wine, tea terminology can get flowery, making it a tad highbrow instead of something that regular Joes can relate to. "I think cheap tea can fit a purpose. Sometimes if you're rushing, teabags are good. It's about spending that extra minute waiting for the kettle to boil and be in the now, rather than worrying about what's going to happen next." The typical tea blogs written in English tend to focus more on reviewing teas and "patting the back of various retailers". Pei finds that "incredibly boring" and prefers to delve deeper into the various aspects of tea rituals: social, mental, spiritual, physical and emotional. Currently, he's in the midst of completing the translation of Lu Yu's The Classic of Tea, into a simplified English version. One of Japan's foremost tea masters who perfected the art of Chanoyu (tea ceremony), Sen no Rikyu (1522-1591), once said: "Chanoyu is just a matter of gathering wood, boiling water and drinking tea; nothing else is involved." I ask Pei what he thinks of Rikyu's words. "I think it comes from the concept of Zen Buddhism. One has to experience tea but stay detached. Through the process, you'll know roughly how hot the water is, what kind of tea leaves they are, what sort of tea utensils you're using and when you serve tea to another person - whether he likes this kind of tea or a stronger brew," says Pei. "Over time, it'll come naturally just like riding a bicycle. The tea process is a fantastic way of practising mindfulness," Pei adds. "One study by a professor in Manchester found that when mental patients go through a chanoyu, they experience calmness and clarity of mind." "But for me, the 'way of tea' is about taking time out from the everyday hurly-burly, focusing my attention on the slow dance of tea leaves against beautiful, wafer-thin ceramic cups. "I contemplate the tea's evolving aroma and realise that what's important is conviviality, harmonious relationships, relaxation of mind, ease of spirit, nourishment of the soul and maintaining the grace in my heart to share my time with others," Pei sums up. We believe that tea drinking is pleasurable, beautiful and delicious, and we aim to share the joy of tea through our Chaya Teahouse, tea appreciation masterclass, tea cookery theatre. The former guide you through the intricacies of authentic tea drink in the correct Chinese manner. The latter will enchant you with truly magical ideas for using tea in food. We will bring Chinese and Oriental sauces and ingredients alive for you and show you our unique fusion of eastern and western cooking styles. We also host HaveTime.DrinkTea free tasting events to showcase our teas and to introduce people to the joy of teas. Our passion for tea led us to create teanamu. The word teanamu means 'bamboo' which is a symbol of longevity, slow pace, strength and grace. It is a challenge to live at just the right pace - to be in 'right relationship' with ourselves, and particularly our physical selves. Most of us have forgotten - although we surely knew it as small children - what it feels like to experience ease, grace and flow, to simply feel, as the French say, 'bien dans sa peau' ('good in our skin'). We believe that it is important to take the time to slow down and nourish our bodies and cultivate our souls. In our eyes, tea is not just for drinking and eating. Not only does tea promote health and the right balance in terms of yin-yang. It is the spirit and the teaching of Cha Dao (tao of tea) that our primary task is to cultivate our soul and seek inter-connectedness with our surroundings and loved ones. Close your eyes and get ready to enjoy the wonderfully rich smoothness on your tongue and the luscious experience of teanamu's indulgent tea appreciation workshops; prepare to love every morsel of teanamu's delectable tea cookery theatre or come and experience tea at our Chaya Teahouse. Please check our events calendar for a schedule of tea events. An article about teanamu and tea artisan Pei Wang written by senior reporter, Leong Siok Hui, of The Star (the leading Malaysia's English newspaper) "Steeped in philosophy". Click here for the online version or here for the PDF version of the article. Teanamu's very popular Lychee Black tea is featured by Helen Gent of sofeminine.co.uk "A nice brew will do you the world of good!". The Independent "The 50 Best Tea Rooms" :- From steaming teapots to scrumptious scones, Rhiannon Batten presents the experts' guide to finding Britain's most brilliant brews. This article, 'Why tea is the new spice rack must-have' by Norman Miller, was published in The Times. In it Mr Miller discusses tea as an ingredient in cookery and as an 'aromatic'. He describes the delicious and beautiful range of 'dishes showcasing tea's adaptability' which Pei Wang produces in the teanamu 'cookery theatre' tea-cooking workshop. A transcript of the article can be found here. The original article can be found here. 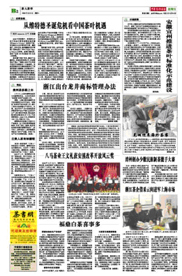 This article by Pei Wang is written in Chinese and was published in "Zhonghua Hezhuo Shibao" - China Cooperation Times. 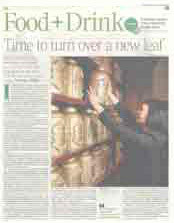 The article talks about the near collapse of Whittard of Chelsea and its implications for the UK tea market.